A rig for smaller club and covers gigs. It comprises two 50w Hughes & Kettner Switchblades whose 128 presets can be recalled on both amps from a single foot controller. It’s fed by a Lehle P-Split passive splitter to overcome ground loops. 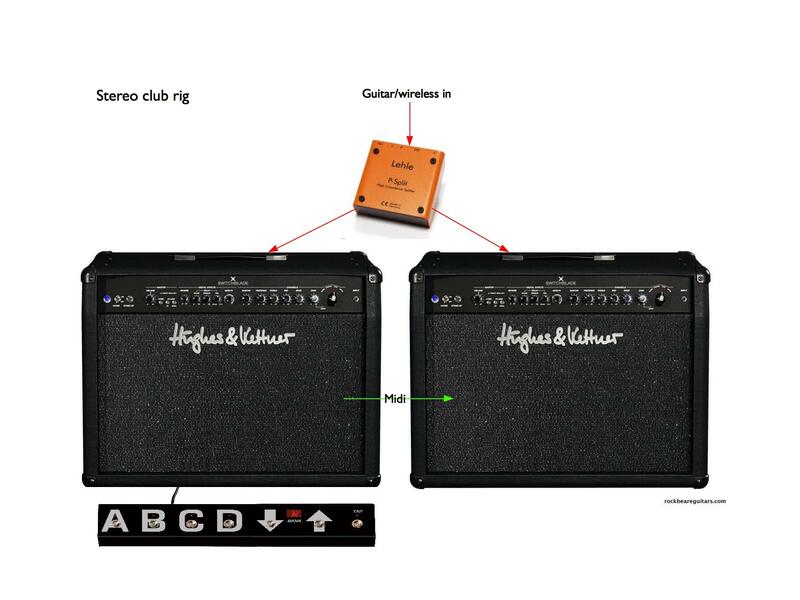 …sounds best when each amp is set to a different sound. Very powerful and flexible, it takes two minutes to set up. Killer. My question is, and please forgive my lack of knowledge if this is at all possible! When you use two Switchblades, do you use the chorus on each separate amps, or can you use the effects loop to get a true stereo between both amps? Our sound engineer has told me that he will miss the swirling left and right ‘panning’….especially on my lead breaks! Is that at all possible with this rig?